1. Preheat the grill to high. Meanwhile, coat the chicken with the jerk marinade, cover and set aside. 2. Meanwhile, toss all the remaining ingredients together in a large bowl, cover and chill. 3. Grill the marinated chicken for about 13-15 minutes, or until cooked through with no pink meat, turning half way through. 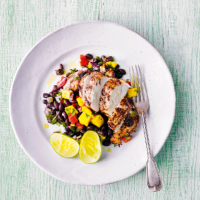 Let the chicken rest for 3 minutes then slice and serve with the mango black bean salad, and some extra lime wedges on the side to squeeze over if you like.